The Sustainable Development Legal Initiative (SDLI), directed by Professor Paolo Galizzi, serves as a focal point within the Leitner Center and Fordham Law School for activities in the field of international sustainable development. Through its expertise in international law, legal education, research and practice, SDLI aims to promote the use of law to foster environmentally sound development and poverty eradication. SDLI has several capacity building projects to address human and resource capacity shortages across Africa, and facilitates legal scholarship and cooperation by sponsoring research projects, conferences and publications on sustainable development both at home and abroad. 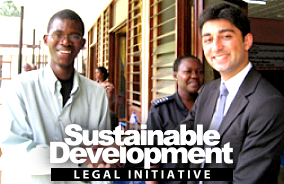 Whenever possible, SDLI’s programs are structured to provide research and internship opportunities for Fordham and local law students, to expose young lawyers to the realities of work in the sustainable development field and all that being a lawyer can mean. SDLI employs a full-time Fellow, Alena Herklotz, who supports Professor Galizzi and the entire Leitner Center team in these efforts.